The smart typography and a radical color palette are a rare example of good design on the campaign trail. On Tuesday, political newcomer Alexandria Ocasio-Cortez won a stunning primary victory over veteran Rep. Joseph Crowley in New York’s 14th Congressional District. Nearly as noteworthy as her political upset, though, are her campaign’s radically designed posters and buttons, the work of New York-based designer Maria Arenas of Tandem NYC. For starters, the design is actually good, which is less common than one would expect in today’s professionalized political realm. And its energetic visual style steps outside the safe and stale boundaries of political campaign design. Ocasio-Cortez’s campaign posters would look just as good promoting a new Netflix series, and they turn her into the star of her own campaign. Since history remembers the victors, we hope the surprising success of Ocasio-Cortez paves the way for more forward-looking and adventurous political design. Ocasio-Cortez’s portrait, taken by photographer Jesse Korman, is the most powerful design element of her branding. Unlike the typical candidate headshot, Ocasio-Cortez’s photo is stylized and dramatically lighted. She looks away from the camera, up and off into the distance as if toward a brighter future. The photo identifies her as a young woman of color, a defining element of her campaign against a 56-year-old white male incumbent. Like Rosie the Riveter in the iconic “We Can Do It” poster, Ocasio-Cortez is dressed plainly but depicted heroically. This impression of an ordinary person being treated as a hero sends its own message and echoes the messages of the Ocasio-Cortez campaign. The design draws inspiration from progressive-era propaganda posters of the 1930s and 1940s, when working-class politics were decidedly leftist. The brand’s prominent use of text-message-style speech bubbles sets the poster firmly in the present. Although somewhat generic-looking and inconsistently treated, this 21st-century visual element subtly suggests that Ocasio-Cortez is the young, in-touch choice. Her campaign expertly uses these speech bubbles to turn the candidate’s positions into rallying cries of “Medicare for all” and “Get money out of politics.” Within a speech bubble, “¡Ocasio!” becomes both a logo and a cheer. The inverted exclamation point celebrates Ocasio-Cortez’s heritage (she is Puerto Rican) and turns her name into exclamatory rallying cry. The tired patriotic star motif is incorporated here in a way that actually feels fun. The design’s energetic, sophisticated use of color is its most radical element. Major-party candidates have rarely embraced any color palette that isn’t red, white and blue. The Carter-Mondale campaign used green and white in 1976 and 1980; Fred Thompson may have briefly flirted with purple in 2008. Yellow has rarely appeared in any serious presidential contender’s campaign beyond the occasional highlight color. 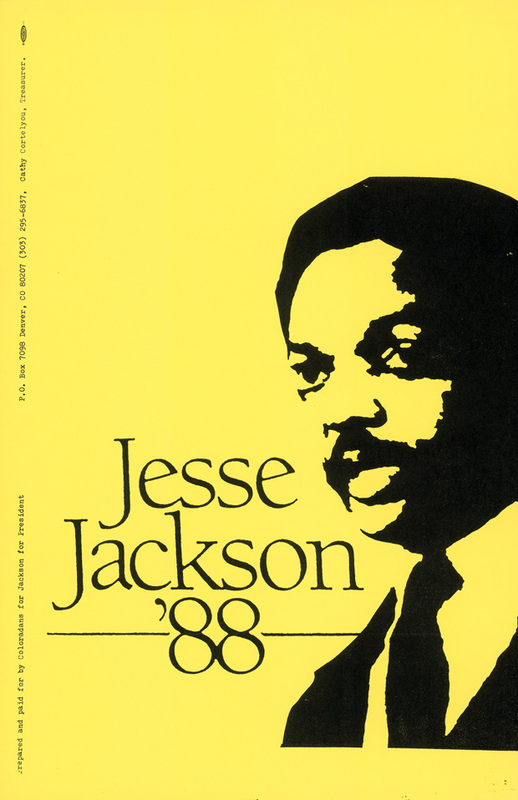 (Jesse Jackson ’88 being the notable exception.) Can we get more of this, please? Next postWHERE ARE YOU OBAMA?